As election season heads into its final weeks, candidates will talk policy as we should. But it’s also important to talk people, because it’s Oakland’s people who drive our values and decision-making. My home is near Lake Merritt. Bessie used to live next door where she raised three generations of her family. Like many African-American families, their long history in Oakland was cut short by the housing crisis. When Bessie passed away, her sons and daughter might have kept the house, but with a reverse mortgage and expensive repairs, they had to let it go. They joined the search for affordable housing or left Oakland for good. Troubled by the loss of Bessie’s family and two other neighbors, my 14-year old daughter Balana wrote an essay about the housing crisis. Her English teacher revealed that Balana’s guidance counselor was forced to leave the school because she didn’t earn enough money to pay Oakland’s high rents. Going home from school, Balana and I pass several of Lake Merritt’s homeless encampments. The East 12th Street camp was founded by Nino, a senior; everyone in the camp is over 55. As he puts it, “Imagine your grandmother living in a tent.” On October 24, the city plans to evict Nino and his neighbors, but there are not enough “Tuff sheds” to house them all, and not all of them even want to move into these sheds. I’ve lived near the Lake 20 years — where I’ve jogged and enjoyed BBQs and festivals, and led children through Fairyland — and this new normal of unsheltered neighbors is not normal. It’s heartbreaking. While the city council drags its feet, one-by-one, hundred-by-hundred, thousand-by-thousand, Oakland residents are pushed out of our city, or onto the streets by the housing crisis. Instead of acting to solve the crisis, the council exacerbates it by evicting our homeless neighbors as winter rains approach. I see a different path. I see solutions at our fingertips, like the Public Lands Policy that the council has delayed for three years. The policy would allow us to convert vacant, publicly owned land and buildings into thousands of affordable homes. It would also allow us to provide a safe space for our homeless neighbors so they can have access to sanitation and services. Weeks have turned into months and years waiting for our council to listen to its constituents — the people of Oakland. A coalition of impacted residents, organizations, and housing experts brought a “People’s Proposal” to council. They identified 36 parcels that could be transformed into over 3,600 affordable units. But this sound plan and resourceful strategies have fallen on deaf ears. Instead, the council has focused on streamlining the development process without any requirement for affordable housing. Our neighbors in San Francisco, Berkeley and Emeryville require about 20 percent affordability, and Oakland, zero. Left to the current city council, only 1,438 of the current 22,000 housing units in the construction pipeline are affordable units. That’s only 6.5 percent. With all the wealth being generated right now by private development, we need to ensure there are fair requirements and community benefit agreements as a part of any development deal. Oakland is in a development boom that could help us thrive or bury us. Profitable corporations and developers must contribute their fair share for the Oakland infrastructure they use to do business, including affordable housing for their multi-income workforce. If a fire or earthquake caused thousands of Oaklanders to lose their homes, local government would jump into action. Our city council needs to treat the housing crisis with the same urgency. We need to use all the tools in the toolbox. FIrst, we must prioritize the development of 100 percent affordable housing projects. Second, we must set requirements for at least 25 percent affordable housing on new development and pass robust community benefits agreements. Third, we must generate new revenue such as charging private, market-rate residential and commercial developers the true cost of their infrastructure burden. Oakland taxpayers should not subsidize profitable, market-rate development. Finally, our council must pass a Public Lands Policy today, not tomorrow, not in three years, but now. 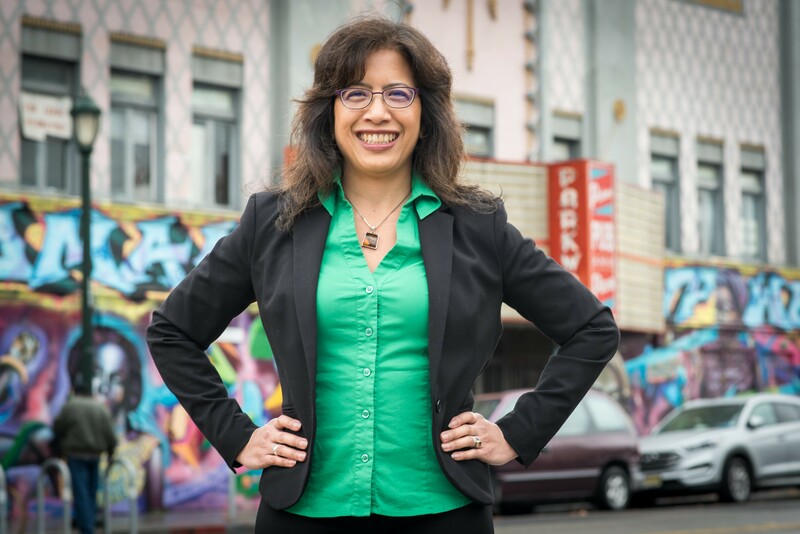 If elected to city council, I will be an independent voice for Oaklanders with years of experience negotiating win-win development agreements between community, labor, developers, and city government. I will be able to represent our diverse community and balance our growth with real equity. Unlike the incumbent, I am not taking corporate and development money. Instead, I will be beholden to everyday Oaklanders. Like Bessie’s children and grandchildren. Like Balana’s guidance counselor, like Nino, and like you and your family. Together, we can build an Oakland for all of us. Growing our power in cities.